At the time, the news of the shooting went largely ignored, but the online activity of the alleged killer, William Edward Atchison, bore all the hallmarks of the “alt-right” — the now infamous subculture and political movement consisting of vicious trolls, racist activists, and bitter misogynists. But Atchison wasn’t the first to fit the profile of alt-right killer — that morbid milestone belongs to Elliot Rodger, the 22-year-old who in 2014 killed six in Isla Vista, California, after uploading a sprawling manifesto filled with hatred of young women and interracial couples (Atchison went by “Elliot Rodger” in one of his many online personas and lauded the “supreme gentleman,” a title Rodger gave himself and has since become a meme on the alt-right). Including Rodger’s murderous rampage there have been at least 13 alt-right related fatal episodes, leaving 43 dead. And more than 60 injured in these incidents (see list). 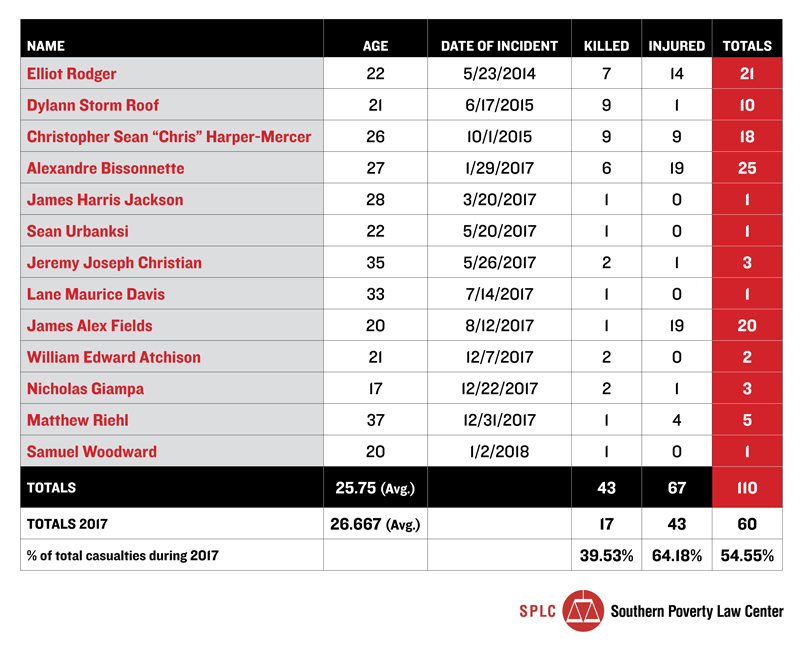 Nine of the 12 incidents counted here occurred in 2017 alone, making last year the most violent year for the movement. On that day, college sophomore Elliot Rodger stabbed his three roommates to death before driving to a sorority house at the University of California, Santa Barbara, and shooting several women. He then killed or injured several pedestrians with both gunfire and his vehicle before exchanging fire with police and eventually taking his own life. He ultimately killed six and wounded 14. Many on the alt-right, including some of its most notorious leaders, like Anglin, spent their early ideological years submerged in extreme image and message boards like 4chan and 8chan. Many credit them with their “red pilling” — a reference to a scene from The Matrix in which the main character chooses between remaining in a comfortable illusion or facing a harsh, but true, reality — which requires taking a red pill. The first killing in 2017 that can be tied to the alt-right occurred on January 29 in Canada. A 27-year-old university student named Alexandre Bissonnette allegedly brought a semiautomatic rifle into the Islamic Cultural Centre of Quebec City and shot and killed six worshippers while injuring 19 — two critically. Many are "wound collectors," a term coined by former FBI agent Joe Navarro to describe, "individuals who go out of their way to collect social slights, historical grievances, injustices, unfair or disparate treatment or wrongs — whether real or imagined." In 2016, there were at least 125 fliering incidents on US college campuses. In 2017, there were over 300. Law goes on to cite a passage of an essay published by Klansman and Aryan Nationsassociate Louis Beam in The Seditionist titled, “Leaderless Resistance.” The section isolated by Law encourages members of a “resistance movement against state tyranny” to decentralize command and organizational structures to avoid infiltration.